Maryland Pink and Green: Molly Ringwald's Book! To me, Molly Ringwald will always be the bridesmaid outside of the church who looks behind her shoulder and asks "Who me?" 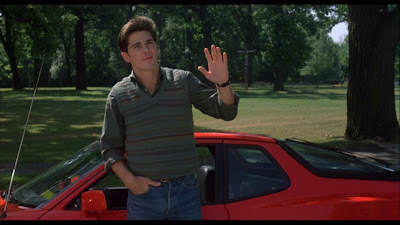 to the handsome Jake Ryan across the street. This iconic 80s figure is famous for her roles in fantastic movies like Sixteen Candles, Pretty in Pink, and The Breakfast Club. But time passes and now Molly Ringwald is celebrating a new chapter of her life ~ age 40! This book, Getting the Pretty Back: Friendship, Family, and Finding the Perfect Lipstick explores how to be gorgeous and smart in your adult life. I can't wait to read this book. It will be especially interesting to hear what she has to share about John Hughes. Wow I had no idea she had written a book! Can I just say Jake Ryan? Still makes me swoon. Weird! I am watching her in an interview on The Today Show right now. You'll have to give an update after you read it, so we'll know if it's good enough. Should be a great beach read! Such good Molly memories! Thanks for the post, I will check this out. Wow- I'm such an 80s child- LOVE all of her movies! That is definitely on my must read list!